This beautiful ankle-length dress is comfortable, stylish & modest! 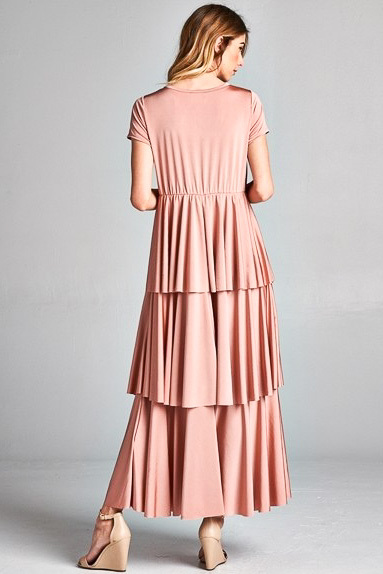 Features include a simple pullover style, gathered elastic waist and gorgeous cascading tiered ruffles on the skirt. The fabric has a "pearl satin" sheen to it, making it dressy & sophisticated. This dress is absolutely perfect for weddings, dances & other special events. If you're rocking a baby bump, this can be a great transition & modest maternity dress with it's empire waistline & stretchy fabric. If you have a pregnant bridesmaid, it's a perfect bridesmaid dress that will work for everyone in your bridal party. It would be a perfect Easter dress or Prom dress too! Length: (from shoulder to bottom of hem) Small 54", Medium 55", Large 56"